On the afternoon of April 23, 1919, U.S. Army Lieutenant Darrell Monteith was in the process of taking off in a Curtis-H military aircraft at Newington, Connecticut, when a group of excited youngsters suddenly ran out onto the field in the direct path of the aircraft just as it was leaving the ground. In an effort to avoid the children, Lt. Monteith made a hard left turn thus avoiding the children, but he failed to clear the top of a 30 foot tree. The airplane crashed into the top of the tree and then went over an embankment where hit two parked automobiles. Lt. Monteith and his mechanic, Sergeant Glen D. Schultz, received non-life-threatening injuries. The aircraft was wrecked. Lt. Monteith and Sgt. 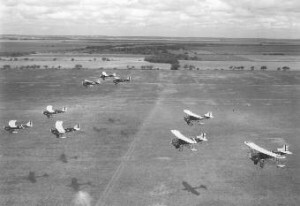 Schultz had been part of a flight of aircraft which had left from Mitchel Field on Long Island, New York, to take part in a Victory Loan air show scheduled to take place in Springfield, Massachusetts. As the flight neared Newington, Lt. Monteith noticed he was low on fuel and landed. The other pilots, after seeing that Monteith was alright, continued on to Springfield where they performed a series of stunts.